The movie is called 50/50, it is a story about; love, friendship, survival and finding humor in some not so normal places. I came it randomly and am sure glad i did. It hasn't been real well advertised but is a great flick and is the perfect way to spend a rainy winter day. 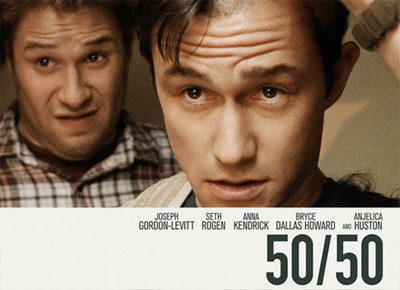 For those of us into a bit of a "dark comedy" 50/50 is a must see. With an impressive young cast including; Seth Rogan (Green Horent & Knocked Up), Joseph Gorden Levitt (TV's 3rd Rock From the Sun), and Anna Kendrick (Twilight Franchise & Up In The Air). The Storyline involves, Adam (Levitt), a 27 year old guy diagnosed with a spinal tumor. He is given a 50/50 chance of survival, hence the title. The twist behind this movie is it is loosely based on Screen writer Will Reiser's own experiances with the Big C. Perhaps it is the unique perspective of someone that has suffered the trials of Cancer that make this story so real, raw and touching. Adam's best mate, Kyle (Rogan), brings a lighthearted shoulder of support throughout the movie. Angelica Houston plays Levitts mother in the film and does an incredible job trying to balance between caring for a husband with advanced Altzimers and trying to reconnect with the son that treats her as if she does not exist. I give 50/50 4.5/5 stars and recommend it highly.